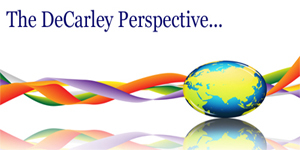 This newsletter was emailed to DeCarley Trading clients on April 11, 2012. Mixed grains, where's the correlation? April has historically been a relatively supportive month for corn and soybean futures. After all, there tends to be weather concerns (too wet or too cold) regarding potential planting delays and the supply of soybeans this time of year is often tight due to declining U.S. inventories and a South American harvest that is just getting started. Simply put, it is too early in the season for traders to be at ease. Compliments of what looks to be a dismal South American harvest and a projected U.S. stocks-to-use ratio of well under 9%, soybean futures have rallied nearly 30% in a little over 3 months. In the meantime, large speculators have accumulated record net long positions. Yet, corn, despite its fairy tale ethanol "story", has yet to follow. Corn and soybeans typically have a correlation coefficient of 90% or more, but recent action has displayed an odd decoupling of the relationship. In fact, the correlation over the previous 180 days has dropped to 79% and, although we don't have stats on it, we'd guess it is well under 50% when measuring from early February on. At some point, prices will look to normalize; this could mean corn will play catch up or beans will fall in sympathy to its yellow counterpart. We tend to believe the odds favor a corn rally to bring things back into line. From a technical point of view, corn is somewhat vulnerable to follow through selling that brings prices to the lower end of the current trading range near $6.00 per bushel in the July futures contract. If global financial markets find a reason to continue the bloodletting, we could see the stops below $5.90 run which could see somewhere in the $5.75 range. However, we aren't counting on this scenario and believe the best trade will be from the long side on dips toward the $6.00 range (if seen). If we are right about support levels holding, corn prices could find minor resistance in the mid $6.60s with a price objective of about $6.90. Soybeans, on the other hand, seems to have priced in a majority of the bullish fundamentals. In addition, with the "smart money" already extremely net long it might be difficult for the market to keep up the pace. Nevertheless, any selling pressure will likely prove to be a simple pause in the bull move and could provide opportunities for those willing to play the upside. Many fundamental analysts, as well as our chart work, suggests "old crop" soybean futures could see prices in the $15.00 range (we've also seen projections for $16 beans but we'll take it one step at a time). In the meantime, should there be a temporary correction July beans could find support in the $13.80 area. If turmoil in the financial markets rears its ugly head, or there is some surprisingly bearish news for beans, it is possible we see a $13.25 print (but this scenario isn't expected). Don't forget, April tends to be a positive month for grain futures...look for opportunities to be bullish on dips; but don't be afraid to be bearish on a small scale on the large rips. Pay attention to support and resistance levels!